They say that things come full circle, and that is certainly true here at Little Walsingham, where the great circle of the liturgical year is the counterpoint to the life of the three shrines, Anglican, Catholic and Orthodox. The saying is truer in a deeper sense, too. 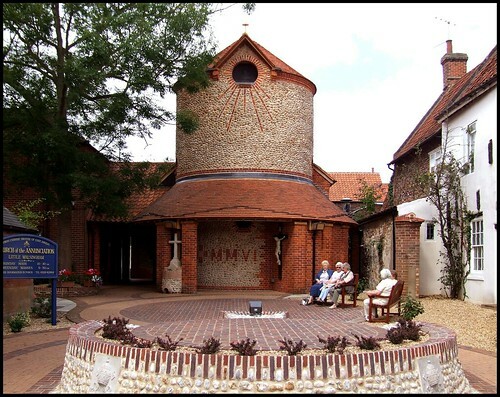 Before the Reformation, Walsingham was one of the most famous Catholic shrines in Europe. During the long penal years, when Catholicism was illegal in England, and the practice of the Faith punishable by death, probably there were few visitors to this remote corner of north-west Norfolk, and most of those outsiders who did find their way here were antiquarians and historians, intrigued by the long-dead past. In the 19th century, the Catholic church returned to England, but still did not make its presence much felt in East Anglia. Frederick Hibgame observed in A Great Gothic Fane: a Retrospective of Catholicity in Norwich, 1913, that for the ordinary Norfolker, the idea that his ancestors had been Catholics was as remote as the idea that dinosaurs had once roamed the land. After the restoration of the English heirarchy in 1851, Walsingham found itself in the parish of King's Lynn, but in the 1890s a Catholic presence was re-established in the immediate area when Charlotte Boyd, a convert, gave the so-called Slipper Chapel at Houghton St Giles to the Church for litugical use. This was certainly not evidence of Catholic enthusiasm in Little Walsingham. Indeed, the Kings Lynn parish records note just one Catholic inhabitant of the place, and she was resident in the Workhouse. Not surprisingly, the Shrine of Our Lady of Walsingham remained at Kings Lynn, but when the Anglicans established a shrine at Walsingham in the 1930s, the Diocese of Northampton, in which Norfolk found itself at the time, rapidy translated the Catholic shrine to Houghton St Giles. As a consequence, Little Walsingham was made a Catholic parish in its own right, and a temporary church built in 1950. It was intended to be replaced as soon as possible. In fact, it remained in use for more than fifty years. Before the Reformation, of course, Catholic priests had ministered at the magnificent church of St Mary, a short walk from here. But in the second half of the 20th century, it was to a little brick-faced hut that the Catholic sacraments returned. Throughout this time, the replacement of the temporary structure with a 'proper' parish church was discussed, but it was not until 1996, under the guidance of Bishop Peter Smith, that the first plans were drawn up. Work commenced in 2005, under the guidance of local architect Anthony Rossi. The cost of the building was well over a million pounds. In no small way this was due to the influence of Bishop Peter, a noted aesthete, who ensured that only the best would be good enough in terms of materials and design. The new Catholic Parish Church of Little Walsingham was consecrated by his successor, Bishop Michael Evans, on the 22nd October 2006. This date is picked out in red brick and flint on the front of the church, beneath a wonderful evocation of old Norfolk, a round tower. In fact, this rises above the sanctuary, and it contains a bell donated by the Parish of Sudbury. In front of the building is an open forecourt, tying the new church into a relationship with the Pilgrim Bureau beside it. The cross survives from the gable of the earlier church. You enter the building through wooden doors into a narthex. One of the first things you see on entering is a reminder that this structure is not merely traditional. A solar energy unit displays how much electricity is being generated by the panels on the roof, how much is being used, and how much stored. 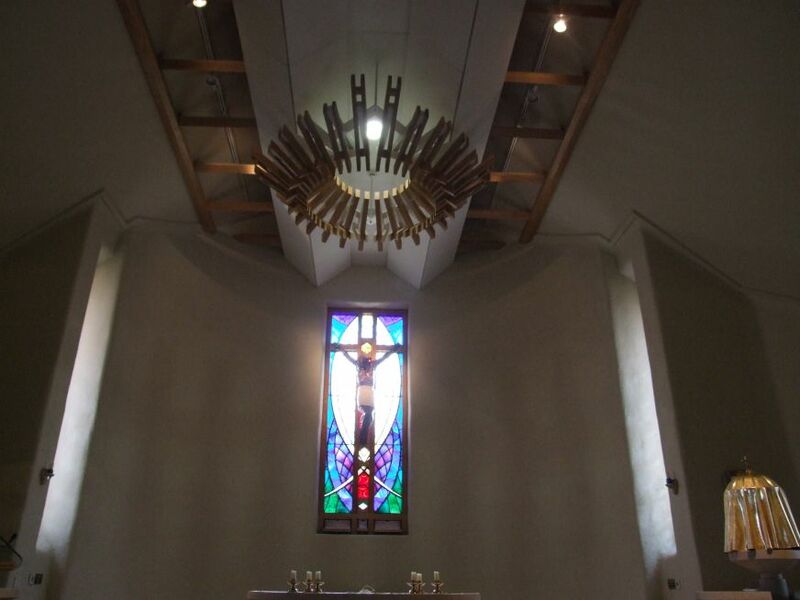 The Annunciation is designed to be Britain's first carbon-neutral church. The interior is wide, open and fan-shaped. 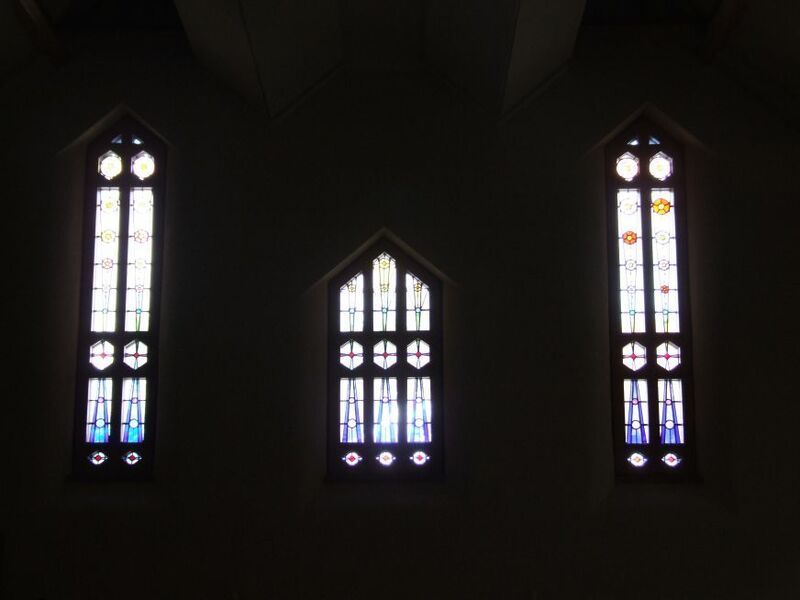 Eyes are drawn to the narrow window behind the altar, echoing a Norman lancet. The other focus, and a stunning one, is the font, with the Holy Oils displayed behind it in containers of coloured glass. The overall sense is of the simplicity and the beauty of modern Catholicism, familiar on this site from Poringland, Wymondham and Ipswich St Mary. Perhaps the interior is not entirely successful. Tom felt that it cried out for a lantern roof, as at Liverpool Cathedral, and in truth the exposed girders are rather oppressive. I also felt that I would have prefered chairs to the benches, which are a bit too Libeskindesque in their strong lines for my taste. Perhaps I am just an old traditionalist at heart. And yet, this building is defiantly of its period, without any cloying traditionalisms. Virtually everything is new; the stations and two statues survive from the earlier building, but otherwise it is all of a piece, the first great East Anglian church of the 21st century. And so, the full circle has been joined. In the 1550s, when the Catholic Church left Little Walsingham, people could not possibly have imagined the modern, beautiful building to which it would one day return.